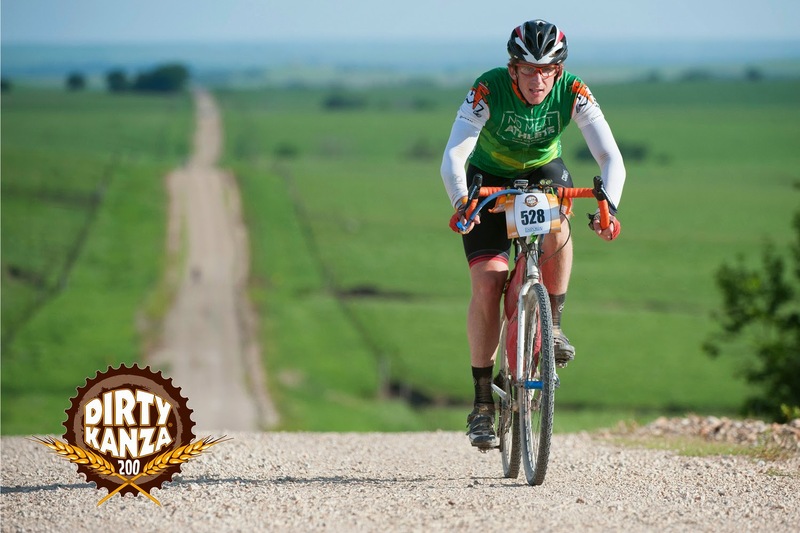 Last weekend, I raced the Dirty Kanza 200 in Emporia, Kansas. The 203-mile gravel grinder in the Flint Hills of the Sunflower State attracted 727 riders to test their endurance against what’s billed as one of the toughest gravel races in the country. Instead, this post is a gear, training and fuel post — tidbits that I hope will be beneficial for future Dirty Kanza racers. Upon signing up for the race, I sought every story, blog post, video, photo gallery and forum I could find. I wanted to have the right gear, train accordingly and know what to expect. So I’m adding my 2 cents to the debate on tire size, tubes vs. tubeless, etc. If I forgot to cover something, please leave a comment below. Last summer, I bought this steel-frame adventure bike for two reasons. I wanted a bike for commuting to work (rack and fender mounts), and I wanted a bike for racing in Spinistry gravel grinders (relaxed geometry, disc brakes, bombproof construction and clearance for 40mm tires). This bike fit the bill. 1. 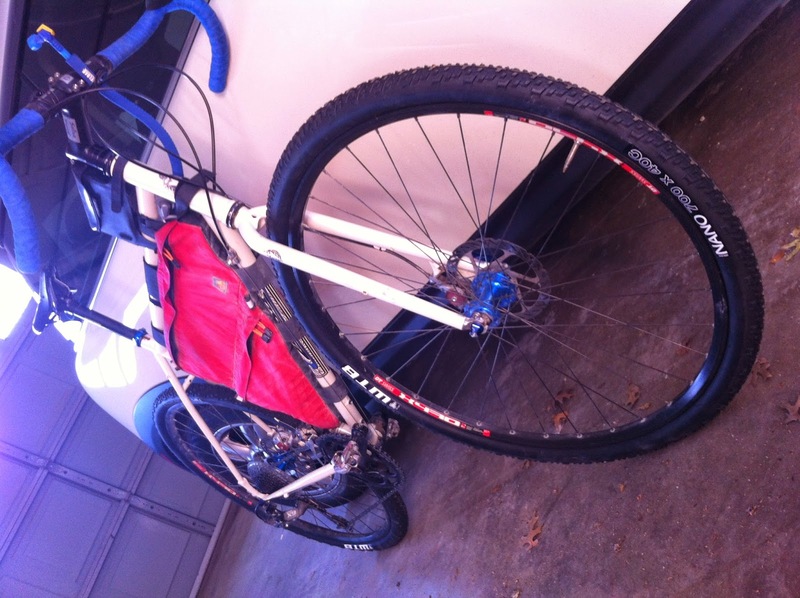 Tires/tubes: The stock Clement X’Plor MSO tires didn’t work out for me at all. I had multiple flats during a training ride, Ride the NETT and MonsterCross for Meals. I know several cyclists that swear by these tires, but they failed me. So I replaced them with 34mm Vittoria Cross XG Pro tires, which were great during my training. These tires were going to be my Dirty Kanza tires until a rock slashed my sidewall during a training ride. It was time to replace them. I decided I needed to roll the largest tire I could muster, something that would have a larger contact area and hopefully decrease the chance of flats on the Flint Hills. I landed on WTB’s newest tire — the NANO 40c. This was a good choice. After a couple of weeks of riding them, I haven’t had a single flat, and that includes Dirty Kanza. I didn’t run tubeless for Kanza for a couple of reasons. I switch out my tires regularly for commuting and gravel grinding. A tubeless setup makes swapping road tires for gravel tires a hassle. Also, if you slash a sidewall in the Flint Hills, you’re going to need to use a tube anyway. I kept my tire pressure high — 55 psi — another calculated risk. Sure, it made for a bumpier ride, but I figured it was another way to prevent flats. How’d that work out? Not a single flat during Dirty Kanza. 2. Saddle and bartape: I replaced the super-cushiony WTB saddle with a firmer, familiar friend — Fizik Arione. I also replaced the stock Salsa cork bar tape with Fizik Performance Bar Tape and Bar Gel. 1. Garmin Edge 500: This was the first year that Dirty Kanza provided turn-by-turn GPS files for racers. You can still download those files here. During training, I was impressed with the performance of the Edge 500, and its battery life was very good. It’s rated to last 18 hours, but I had my doubts leading up to Kanza; so I also wore a Garmin Forerunner 220 for a backup GPS. Fortunately, I didn’t need to use it. I finished the race with 27 percent battery to spare. 2. Gemini Duo front light and Serfas Thunderbolt tail light: I had hoped I’d finish Kanza before the sunset, but I was about 11 minutes too slow. I was prepared though, with a super strong beam on my handlebars and also a Petzl headlamp for reading my Garmin and cue sheets — definitely a good idea to go this route if you’re navigating at night. 3. Cue sheet holder: I’ve seen all manner of ways to hold cue sheets. I opted for an old-school pencil holder ziptied to my bars — wind and waterproof. I saw several cue sheets on the Kanza course that may have been blown off by lesser holders (or, perhaps, tossed by littering racers). I trimmed the 12 sheets and taped them into two sets — three cue sheets on each side of two sheets with left turns highlighted yellow (when you’re exhausted on the bike on a bumpy road, a splash of color makes reading much easier). 4. Topeak Road Master Blaster frame pump and Topeak Tri DryBag: A quick confession — I do not trust CO2 pumps. More accurately, I don’t trust myself to use them correctly. So I opt for a pump that always works and fills the tire as much as I need. And Topeak’s waterproof bento is perfect for holding food and iPhone. 5. Nuclear Sunrise Stitchworks Frame Bag: I saved the best for last. This is my favorite piece of equipment. Custom made in El Paso to fit my frame, this bag is such a smart investment. It easily held bananas and a 3 liter Camelbak bladder in the top pocket, and six tubes, a multitool, tire levers and chain links. And there was ample room left for extra stuff. I can’t overstate how nice it was to know I had plenty of water that wasn’t going to pop out of bottle cages (saw several bottles pop out of saddle-mounted cages) and that I didn’t have to carry on my back. I live in Dallas — a paved paradise for motor vehicles. My biggest source of training was my commute to work — 20- and 28-mile roundtrip options three to four times a week. 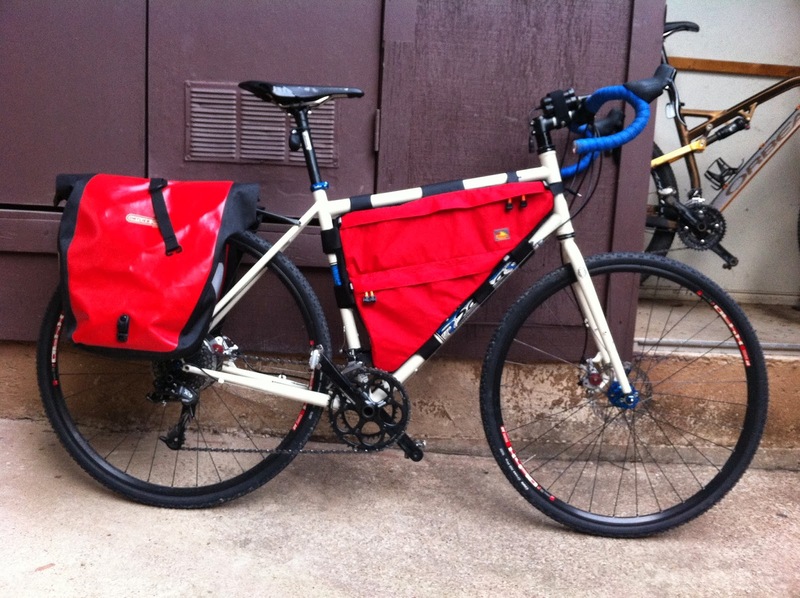 I rode with a rack and loaded panniers (see photo above). I credit the additional weight of my gear in the panniers for making my rides tougher and me stronger. On days when I didn’t ride to work, I often ran in the morning or afternoon, typically 5 to 8 miles. On weekends, I rode as much gravel as I could. In particular, I rode Spinistry race routes — Red River Riot and Texas Chainring Massacre — and Dallas’ Trinity River Levees. I also mountain biked and hit the roads around Mesquite/Sunnyvale to keep things interesting. The longest ride I did before Kanza was 133 miles. I also logged a few more centuries. Most weeks, I tallied 180 miles total. • Several flavors of Clif Bars (ate eight) and gels/goo (probably eight of these, too). • Eight tortillas and four 20-ounce bottles of Gatorade: I started eating tortillas when I trained for a 12-hour race about two years ago. They don’t offer much in terms of nutrition; I should consider a better option. Also, I need to make the transition to Perpetuem for my drink choice. While I appreciate its calorie count, I just can’t appreciate the chalky taste. • Maybe 80 Endurolyte tablets: I started the race taking four to five every hour. And then my right thigh started to cramp around mile 110. So I upped the dose to four to five every half hour. • I also ate other things at the checkpoint locations, including more bananas, iced coffee and a chickpea-avocado salad sandwich. If I had to make a change, I’d probably have another sandwich and throw some peanut butter on a couple of slices of bread throughout the day, too. These things worked for me, but there's not a single perfect plan, bike and/or food that will guarantee success at Dirty Kanza. There's skill (and luck) involved, too. I'll write about those aspects of the race and the entire fabulous Dirty Kanza weekend shortly.